Why did you write Brockwell the Brave? My first book, Ride High Pineapple, was based on myself and my eldest daughter. I wanted m second book to be based on my son. He also has my craniofacial syndrome but I didn't want to write a boy version of the story. I decided to focus on another of my son's qualities. He is not your typical boy. My son growing up has been a quiet, gentle and you could say, 'girlie' boy. He was always into dressing up, he loved dancing, he didn't possess any action figures or trucks or cars. He owned 'girl gender' toys, loved sparkles and the colour pink. My son is now 14 and has hair nearly down to his bottom. He loves to read, to draw, to cook, video games and his soft toys. Now one could say this is a product of his circumstances and environment. He has two sisters, so he grew up playing with them, and his friends from kindy upwards have been girls as well, so he has grown up in their world. My son was also banned from playing sport growing up because of his face. And his hair was shaved off multiple times with operations, so there could be a subconscious want to have a long hair. Who knows? But it doesn't matter to us. We love him how he is. The story Brockwell the Brave, is set in a fantasy Viking village called Enga. Brockwell, the main character, lives on a dragon farm. Even though the village is a fantasy, everything else relating to the village and Viking way of life, is factual, including the names used. Throughout the story I have inserted the Icelandic language which is the closest modem day language to Old Norse. This added some extra authenticity to the story. I chose the dragons as my son asked for dragons to be in the story. At the time, he has obsessed with the How to Train Your Dragon series and was collecting the dragons he liked. I was very conscious, not to make my book similar to the films or books. Wat is the story about? What did you enjoy the most about writing the story? I really enjoyed researching the Vikings way of life. I learned a lot! I enjoyed researching Old Norse names for the names of the characters. And I loved creating my own type of dragons and deciding what they would be used for in the village. I wanted them to be unique and the babies adorable. If you could own a dragon, what would it look like? Hmmm, my dragon would be hot pink, with scales that shine like the colours of the rainbow. It would be more cute than scary. It would probably also have a silver heart on its side, as I love anything with hearts. What would people get out of the story? 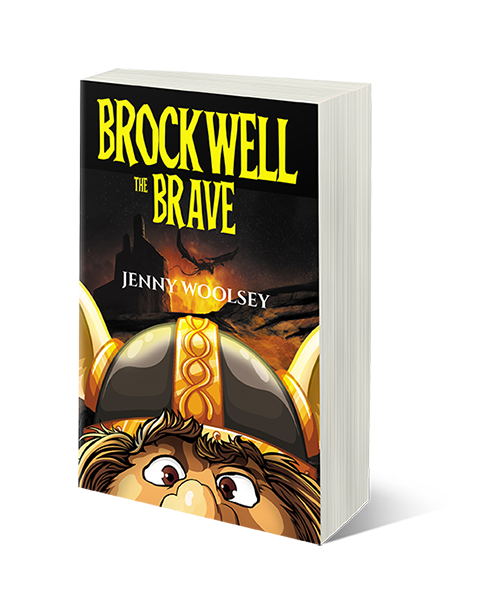 Brockwell the Brave provides an insight into the world of the Vikings and teaches some of the Icelandic language. The story is a fun adventure with a magical component. It challenges gender stereotypes of both boys and girls. It teaches a child it is okay to be themselves, and that they can face their fears. Where can people buy Brockwell the Brave? Brockwell the Brave is available as an ebook and a paperback. It can be purchased from many online bookstores which are listed on my website, and from me directly, via my website.